Chances are, somewhere in your home you have at least one example of technology that once was cutting edge but now is obsolete—perhaps broken. You’d like to sell it for cash if you could. Yet the complexities of eBay are just too daunting and you absolutely don’t want strangers knocking on your door in response to a Craigslist ad. You’re also opposed to tossing it out with the garbage to have it buried in a landfill. A multitude of websites and major retailers—including Radio Shack, Sears, Wal-Mart, Costco and Best Buy—are running trade-in programs, competing to buy a surprisingly wide assortment of used consumer electronics products directly from individuals. They will also pick up the shipping costs, or conduct the transaction at a store near you. And even if your stuff is truly worthless, they’ll still take it for proper recycling, albeit without free shipping or compensation. With all these programs, the trade-in procedure is normally straightforward. It starts with a visit to a trade-in website where you’ll navigate through categories of products the business will accept, to locate the exact product you want to sell in the site’s listings. After you’ve answered questions about the condition of your item, you will receive an estimate of its trade-in value. If you then agree to accept this payment, the program will provide a pre-paid shipping label—and may also provide the packaging material—for you to send the item to an evaluation center. Once it’s received at the center, your item will be evaluated. If its condition matches your assessment, the agreed-to payment will be processed, and should be mailed to you within weeks. With in-store trade-ins, you’ll still go through the first steps online, but then carry the item in yourself for evaluation by a store employee, who may pay you on the spot, usually with a store-issued gift card. There are too many trade-in websites to list and cover in this space, but some of the leaders—which you should consider checking first—are BuyMyTronics.com, Gazelle.com and CExchange.com. Both Gazelle and CExchange also are the engines behind some private-label trade-in programs. These include programs at Costco.com, Walmart.com and Sears.com operated by Gazelle, and those at RadioShack.com, Crutchfield.com, CircuitCity.com, Wirefly.com and BrandSource.com operated by CExchange. The trade-in center at BestBuy.com is powered by Dealtree.com, which the retailer owns. Don’t check just one trade-in program, though. Values offered for the same item, in the same condition, can vary widely from site to site, even among sites operated by the same back-end provider. Recently, for example, RadioShack.com valued a Sony 40-inch HDTV (model KDL-V40XBR1) at as much as $282.03, while CExchange valued the same television at as much as $331.80. The amount paid also can vary with the type of compensation you choose. For instance, Best Buy will reduce its offer if you choose to receive cash for your trade-in rather than a store gift card. Meanwhile, Gazelle.com will pay you a five percent bonus for choosing an Amazon.com gift card rather than its other options—a check, a PayPal account deposit or a donation to one of more than 100 listed charities. There is one more reason to shop around at different trade-in programs: They don’t all take all kinds of products. 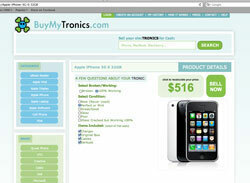 For example, BuyMyTronics does buy e-book readers like the Amazon Kindle, but CExchange does not. 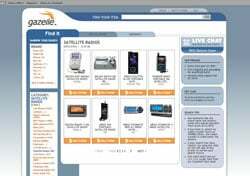 Although Gazelle buys satellite radios, BuyMyTronics does not. Neither BuyMyTronics nor Gazelle buys HDTVs, but CExchange does. Of course, the programs are constantly expanding the product categories they cover, and the number of products listed within those categories. For example, Gazelle now encompasses 20 categories and more than 50,000 products, up from 12 categories at the end of 2008, according to Kristina Kennedy, senior manager of branding and communication. 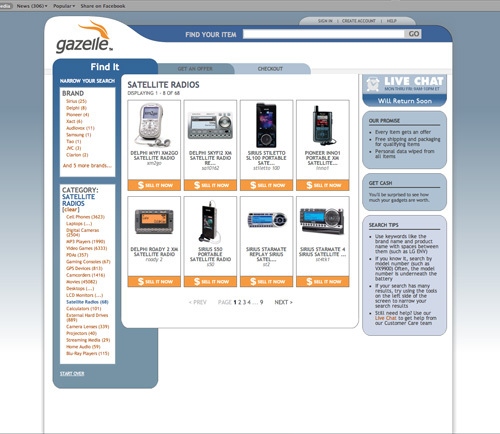 However, if you can’t find what you want to sell at Gazelle or CExchange, both of those websites also allow you to suggest products to add to their trade-in lists—within the confines of the categories they already cover—and Kennedy says Gazelle makes personalized offers to users who take this step. Finally, the timing of your trade-in could be important, too. In general, Kennedy says, products post sharp declines in value in their first six months on store shelves, and then more gradual declines. Popular products will retain higher values longer, and could still be saleable three years past their debut. Nevertheless, at any time it’s possible for a trade-in value to drop dramatically if a product’s popularity wanes. 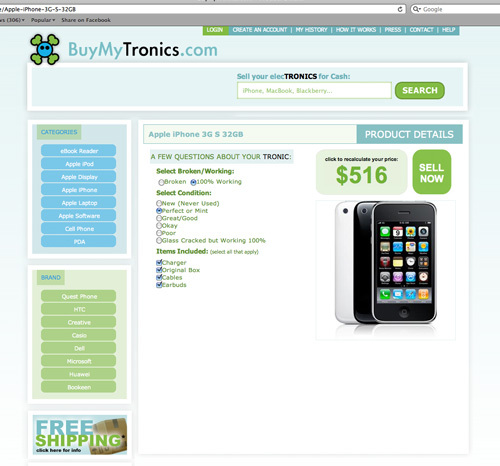 BuyMyTronics was recently paying $516 for the now top-of-the-line 32GB iPhone 3GS in mint condition with its original accessories, and $55 for a first-generation 4GB iPhone in poor condition without its original accessories. At Gazelle, an iPhone 3G in good condition fetched an average of $301 just before the launch of the iPhone 3GS, but only $171 three weeks post-launch, Kennedy notes. Thanks! Let us know how that goes. Thanks from me too!! I have used Bestbuy for trade ins, but I have many items they don’t take or offered me nothing for. 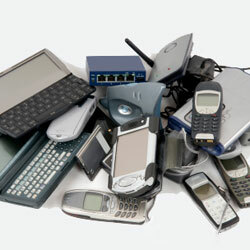 I like the possibility of finding another trade in company that would take my delinquent electronics!! Is there any chance I could get my hands on some cheap electronics through this trade in method? I plan to open a second hand electronics retail store, this would be the perfect opportunity to get lots of products on a low price.